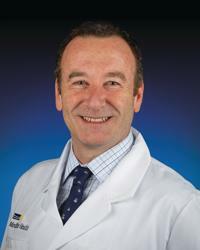 Giuseppe Esposito, MD, is board certified in nuclear medicine. He sees patients at two MedStar clinics the Reservoir Road clinic in Washington, DC, and the Olney, Maryland clinic. Dr. Esposito is the Chief of Nuclear Medicine and PET/CT and Professor of Radiology at the Medstar Georgetown University Hospital. His specialties include PET/CT and SPECT/CT imaging of tumors, cardiac diseases, epilepsy, dementias and Parkinson's disease. In his clinics, he also performs diagnostic imaging and treatment of thyroid cancer and hyperthyroidism, prostate bone metastases, radioembolization of metastatic liver cancers, and PRRT treatment of Neuroendocrine tumors. Dr. Esposito enjoys talking with his patients and answering their questions. Many patients are not familiar with nuclear medicine, so he takes great care to explain the procedures to make patients feel comfortable educating them on the benefits and the potential side effects. Dr. Esposito is a native of Italy and has lived in the U.S. since 1992. He travels to Italy frequently, with his wife and two daughters, to see the rest of his family in Naples.